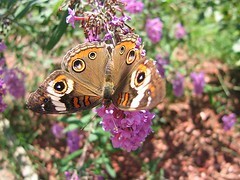 Common Buckeye. - Welcome to The City of Desire. Although I fully intend to answer emails and comments directed towards me, I had planned on taking a break from posting on LJ for the rest of the week. I can't help but share this photo, though. Finally, a different kind of butterfly has visited my garden! I'm pretty much failing at taking a break from LJ, anyway. I thought I was acting too testy from spending too much time on the computer, but maybe it's just too much caffeine. I'll probably post an entry tomorrow, anyway!